Coming soon to a Riviera near you, this is the Lamborghini Huracan Spyder, revealed at the 2015 Frankfurt motor show. The Lamborghini Huracan LP 610-4 Spyder, to give the latest open-air Lambo its full title (‘610’ for its metric horsepower output, ‘4’ to signify four-wheel drive), succeeds the Gallardo Spyder, the best-selling open-top car in Lamborghini’s history. 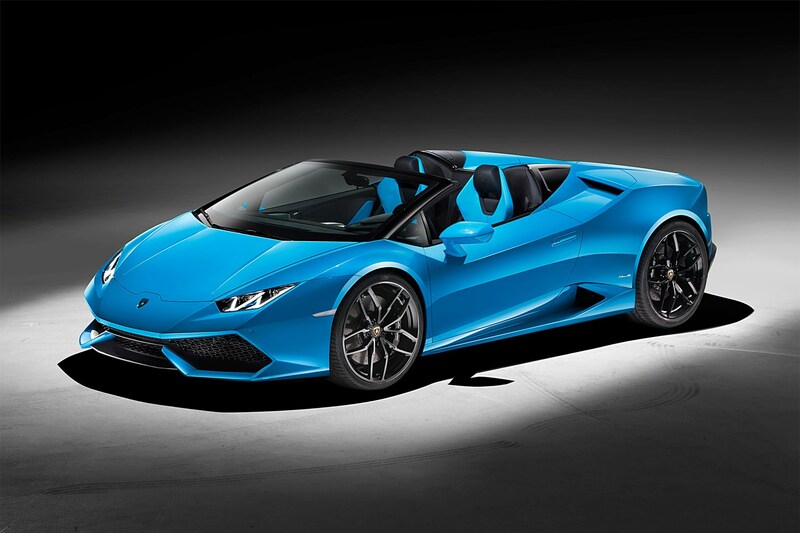 ‘We expect the Huracan Spyder to exceed its predecessor in every way,’ says Lamborghini president Stephan Winkelmann. On the technical side at least, the Huracan Spyder’s certainly got the minerals. The Huracan’s part composite but predominantly aluminium chassis possesses torsional stiffness 40% better than the Gallardo Spyder, which, intoxicating a driving experience on the road as it was, did feel a little soft-edged on track. The Huracan Spyder’s flat-floored body can also conjure up to 50% more downforce than the Gallardo. Dry weight for the Huracan Spyder is 1542kg. Like the Gallardo, the electrohydraulic roof is a fabric soft-top rather than a folding arrangement of metal or composite. Pick from three colours for the soft-top: black, brown or red. It takes 17 seconds to open, while the Huracan’s travelling at up to 31mph. Hidden automatic pop-up rollover bars ensure the lines aren’t spoiled when it’s stowed, with with sharp-creased buttresses behind the seats and a different slatted engine cover compared with the fixed-head Huracan. Same 602bhp 5.2-litre V10 and seven-speed dual-clutch gearbox as the hard-top Huracan, now with fuel-saving cylinder-on-demand and stop-start tech for the 2016 model year. The Huracan Spyder officially returns around 23mpg – although that’s hardly likely to be a decisive purchase factor. What might be is a top speed just the right side of 200mph, 0-62mph in 3.4 seconds and fade-fighting carbon-ceramic brakes as standard (with enormous 380mm discs at the front). The controversial dynamic steering’s still an option – we’d leave that box unticked. Click here to read a comparison of two fixed-head Lamborghini Huracans, one with the dynamic steering and one without. Deliveries begin in spring 2016, priced at a cool £205,000.